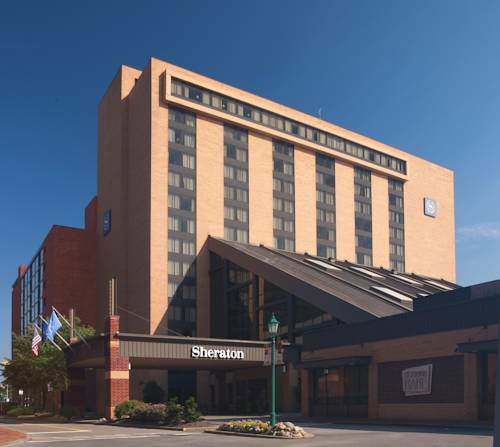 Experience the city's premier riverfront hotel, Sheraton Pittsburgh Hotel at Station Square. Our exceptionally located hotel offers guests stylish rooms with views, welcoming amenities and an unmatched riverfront location. As part of Station Square's array of restaurants and entertainment venues, our hotel gives you fast access to all of Pittsburgh's most famous attractions. Attend games at Heinz Field or PNC Park, take a chance at Rivers Casino or ride the Duquesne Incline. After a busy day of exploring Pittsburgh, you can enjoy delicious dining in our signature restaurant, go for a swim in our indoor heated pool, or stretch your muscles in our 24-hour Sheraton Fitness Center. The waterfront setting of our downtown hotel adds an extra layer of elegance to our expansive indoor and outdoor event spaces, making them the perfect choice for weddings, business meetings and social gatherings. Whether staying with us for fun or for work, we look forward to welcoming you to our hotel in Pittsburgh, Pennsylvania. Trackside: Get energized for a busy day of exploring Pittsburgh in our inviting restaurant. Take in postcard-quality views of downtown while you enjoy a delicious breakfast, join colleagues for lunch on a meeting break, or relax over dinner with the family. The Center Bar: Grab a quick bite to eat in our stunning atrium lobby before heading off for a night of fun. The casual setting is ideal for after-work cocktails, or a light snack to keep you going as you get ready for another fun outing in Pittsburgh, Pennsylvania. Sheraton Caf : Stop by our Caf for freshly brewed Starbucks coffee and made-to-order espresso drinks, perfect for jump-starting your day. Pack a picnic from our selection of grab-and-go food, or pick up a snack to satisfy a late-night craving.